Emma Fisk's Hot Club du Nord bring to life the classic 1930s and 40s repertoire of Django Reinhardt and Stephane Grappelli's Hot Club de France. Featuring Emma Fisk on violin, James Birkett and David Harris on guitars and Bruce Rollo on double bass, the band encompasses a wealth of experience, knowledge and love of the hot club style. At a Hot Club du Nord performance you can expect to hear a selection of the popular songs, jazz standards and Reinhardt/ Grappelli originals as performed by the original Hot Club during the 1930s and 40s. You will hear fresh, inspired interpretations of the material aswell as recreations of some of the delightfully quirky and sweet arrangements from the original recordings. A treat for connoisseurs of swinging string jazz and lovers of all things vintage. is destined for stardom, or, at the very least, a full diary of engagements up and down the land...."
The names of Django Reinhardt and Stephane Grappelli are familiar to many as pioneers of string-based swing jazz. Less universally known are the names Joe Venuti and Eddie Lang, the Italian-American duo who played hot violin and guitar jazz in the 1920s and 30s until cut short by Lang’s untimely death in 1933. Joe Venuti has been referred to as ‘the father of jazz violin’, ‘the first great violinist of jazz’ and was a leader in the development of jazz violin techniques and style incorporating frequent double-stops, racing scales, pizzicato as well as his infamous four-string bowing. He switches effortlessly between sweet singing melody and hard swinging fireworks. His musical partner Eddie Lang is widely regarded as the first jazz guitar virtuoso. His agile, powerful single string technique combined with a sophisticated approach to chordal accompaniment to set a completely new ‘gold standard’ for the instrument. In addition to his seminal recordings with Joe, Eddie was the number one session guitarist in New York during the 1920s, appearing as a featured sideman with all of the major artists of the time, including Bix Beiderbecke, Louis Armstrong, Jack Teagarden, Bessie Smith, Paul Whiteman and Hoagy Carmichael. 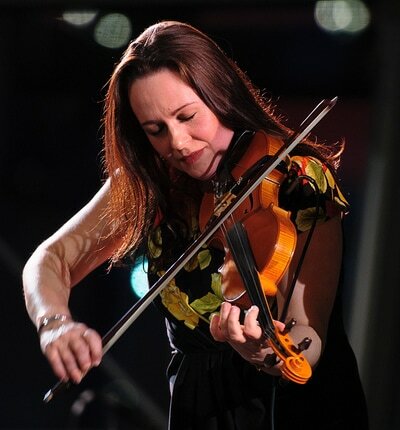 Emma Fisk has performed Venuti’s repertoire at numerous UK jazz festivals with Keith Nichols, renowned bandleader and authority on classic jazz, and recently featured in the musical role of Joe Venuti with The Jazz Repertory Company at Cadogan Hall as part of the 2015 London Jazz Festival. 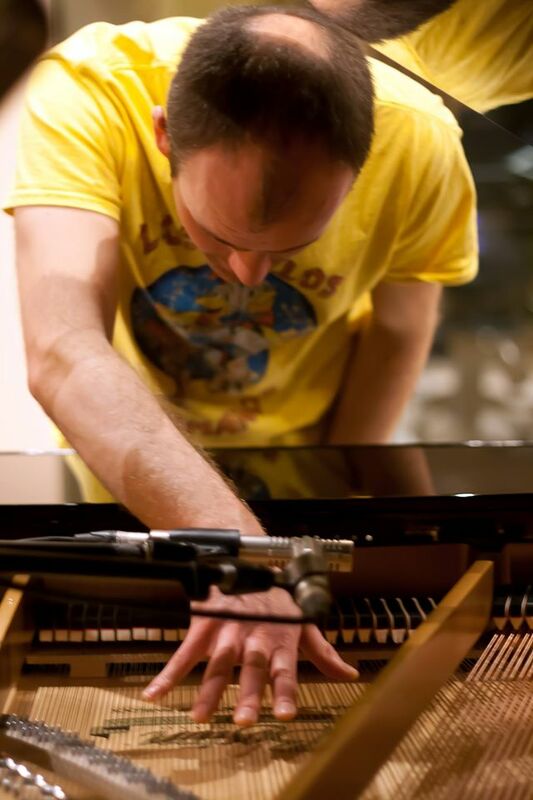 James has been performing Lang’s repertoire since he was introduced to this music in the late-70s. However, it is only now that he has realised his ambition to recreate the duo repertoire of Lang and Venuti in concert in the original duo setting with Emma. Bringing together their shared knowledge of early jazz styles, Emma Fisk and James Birkett present an entertaining and informative programme of music associated with the first great violin and guitar jazz partnership. 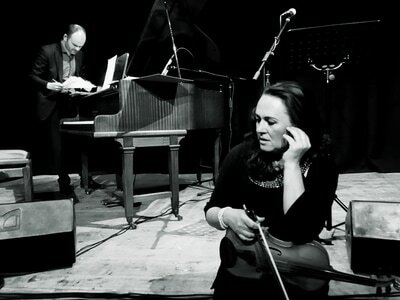 Emma and critically acclaimed pianist/composer Paul Edis created this varied programme by special request for an event at Crook St Cuthbert's Centre in October 2016. It proved extremely popular with the audience there, with attendees commenting on how much they enjoyed the variety of music included in the concert. The programme consists of jazz, classical and tango music from the period 1880 -1950 including music by Dvorak, Elgar, Astor Piazzolla, Villoldo, Fats Waller, Stuff Smith and Gershwin. Both jazz and tango were emerging in the late 19th century and by the 1920s and 30s had become hugely popular on both sides of the Atlantic. At the same time classical composers were writing music influenced by these emerging popular music styles as well as pieces that were 'pop-music' in their own right - for example Elgar's 'Chanson de Matin'. From the tango repertoire Paul and Emma have chosen pieces by early tango composers Villoldo and Mendizabal; examples of Carlos Gardel's tango cancion and Piazzola's Nuevo tango, and of course the most famous tango of all, La Cumparsita. Classical music included in the concert ranges from extremely well known compositions such as Massanet's 'Meditation' and Elgar's 'Chanson de Matin' to less well known pieces by Lili Boulanger and Bohuslav Martinu. 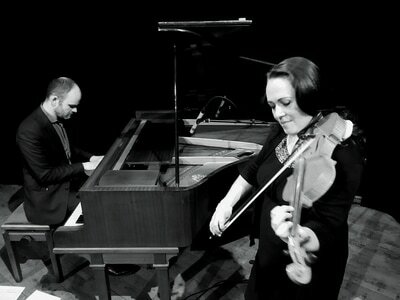 From the world of jazz Emma and Paul have chosen music associated with jazz violinists Joe Venuti, Stuff Smith and Stephane Grappelli, plus some of their own favourite tunes! There are also pieces that cross stylistic boundaries, such as arrangements of Kurt Weill's music for The Three Penny Opera and Besame Mucho - a popular Latin hit written by a concert pianist that has since become a jazz standard! This varied musical offering is perfect for arts centres, village halls and lunchtime concerts and will appeal to a broad audience. "Let me say from the outset, the whole evening was tremendous – a musical tour (de force) across continents, centuries, and genres - a violin masterclass interspersed with information and anecdotes about the composers and their music." Noted for the way that they maintain the swinging spirit of the great Reinhardt – Grappelli outfits but without trying to be a carbon copy. Firmly rooted in the Hot Club sound of the swing era, all four members of the band have a detailed acquaintance with the gypsy jazz tradition.They use this knowledge not just to recreate classics from the past but to apply the approach to a growing book of excellent originals played with virtuoso brio by four of the finest exponents of the style. 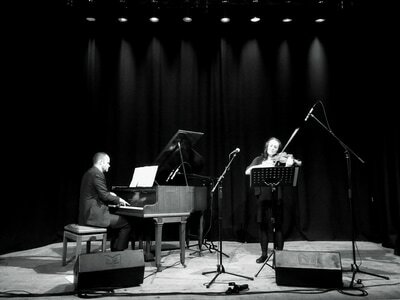 With their intense brand of swing, Djangologie continue to draw, thrill and entertain ever-increasing audience numbers. Converting the new and definitely supplying the goods to any hot club aficionado. However you choose to describe the music, one thing is indisputable - it really is tres bonne. A promotional video made by Jazz North gives you a taste of Djangologie's style and repertoire.